The exam proctor has an “Examiner or Candidate Bulletin”. In this bulletin you will find information such as what is allowed into the exam room, what reference materials to bring, the length and time limit of the exam and finally the subject areas which tells you exactly what needs to be studied. 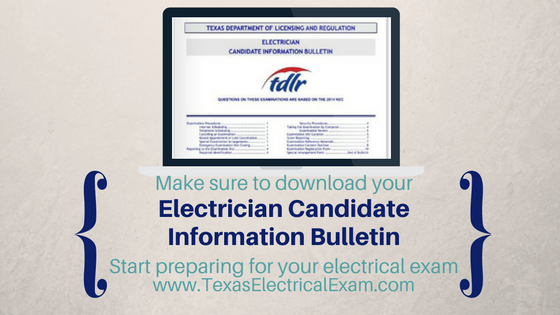 As soon as you plan to apply for the Texas electrical exam you need to download the latest Candidate Bulletin. This is the booklet that will tell you everything you need to know about the electrical test. You’ll get information on how to register for the test with PSI. You’ll learn about how to pay for the test, how much will it cost to take the test, what to bring with you, what to leave at home, how the questions will be presented and what time limit you have and more. Pretty much the entire electrical exam candidate bulletin book is important so read it front cover to back cover. Don’t worry, this isn’t a huge book, it is only 13 pages long and the majority won’t apply to the type of electrical license you are after. You don’t have to print this book, you can mark this pdf as a bookmark on your browser, or you can download it and save it on your computer in a visible place so you don’t forget about it. If you are on a very tight budget and don’t want to spend a ton of money on programs or seminars, you can use this bulletin to help you create a solid study plan. This is what every instructor bases his courses and seminars on, this is the foundation for preparing to take the electrical exam. After you read this book it is very important that you find practice exams, preferably ones you can do on the computer. I mean the test will be on a computer by default unless you request a paper and pencil test but that hardly ever happens. Wouldn’t you want to practice taking the test as close to the real deal as possible? Click here for links to websites that offer free practice exams online. You don’t have to buy anything. 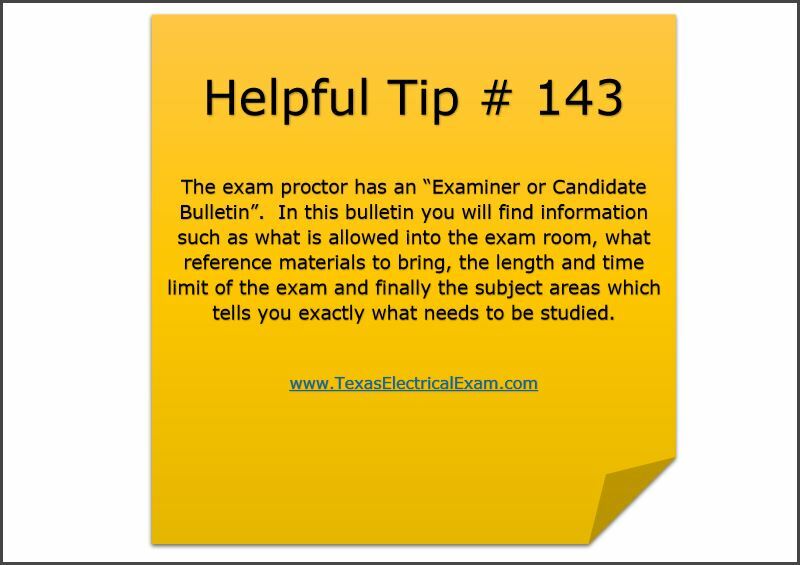 Just be warned some questions may not apply to the Texas electrical test but it still gives you a great opportunity to learn where articles and tables are on your National Electrical Code Book ®. When you are taking practice exam questions be on the lookout for the following subject areas and categories, pay special attention to these and highlight what you find on your book. We took out a few of the frequently asked about topics and created a blog about it a while back, you can find that article here. I’m a little pressed for time now so instead of typing up their table of contents I’m sharing an image of it. 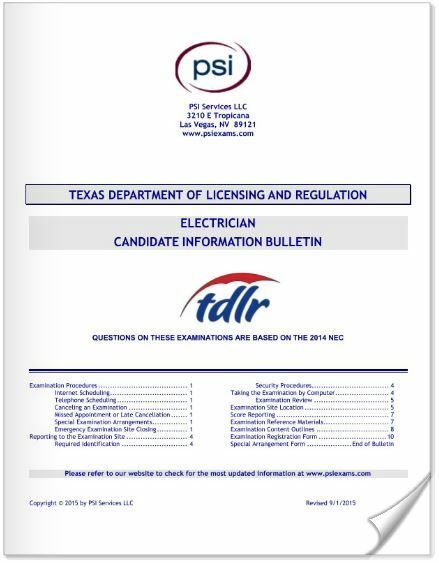 Click here to Download the Electrician Candidate Information Bulletin from PSI. Thank you for reading and if you have any questions don't hesitate to email us contact@texaselectricalexam.com.